to all WLC players, family and friends to our first newsletter of 2017 for what we hope will be another successful lacrosse season for the club. In addition to our usual communications via Facebook and TeamApp, which we encourage all to join, we will be sending out regular emails providing information of fixtures, results, upcoming events, and general news. As you are no doubt aware upgrading works continue on the Fearon Reserve. Works to date include levelling, new irrigation system and finally turf being rolled out this week. There have been a number of setbacks to the upgrade which will basically mean we will not be able to use the Fearon until the turf has fully taken. Council have indicated mid-May before we might get access. We will continue to update you on the progress but we need to be patient to ensure the surface is completely ready for use before we start using The Fearon again. In the meantime we have been working closely with council to ensure we have suitable training and playing venues. Players should keep an eye on Team App for any changes to training venue & times. State League - Damien Orr, Div 1 - Mark Butler, Div 2 - Lee Davis, Div 3 - Simon Brown & Cartl Radford, U 17 - Sean Clarke, U 15 - Darren Nicholas, U 13 - Chris Welsh, U 11 - Carl Radford & Duncan Russell. The club works towards keeping fees as low as possible through sponsorship and Bar profits. The commitee is pleased to announce that registration fees remain unchanged from 2015 & 2016. Seniors (includes a $25 uniform levy). Full Fees $325 Fees to paid in FULL by end of May, 2017. Early bird $300 If paid by Saturday 30th April, 2017. Juniors (includes a $50 uniform levy). The club relies and appreciates the support our sponsors provide each year. Sponsorship is integral to the running of the club and ultimately to our success. Sponsorship is used to keep player fees down, provide essential resources and most importantly allows us to actively engage in junior recruitment and development. The club wishes to thank the organisers of the Klemm-Bell Surfboards 50th anniversary reunion held in Williamstown in Janurary. Their kind donation from funds raised on the day wil be used for Junior Development. Anyone wishing to sponsor the club are asked to contact the club to discuss details. 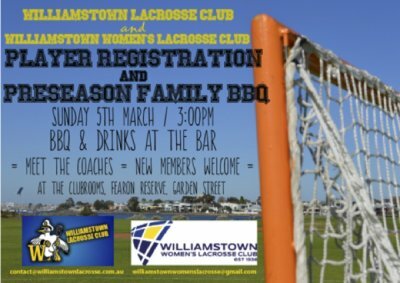 All Senior & Junior players, family and friends are invited to the Player Registration & Pre-Season Family BBQ at the WLC Clubrooms from 3pm onwards on Sunday 5th March.